…an ideal travel accessory, offers flexibility in use, e.g. on a bright daylight window or on the bathroom mirror. 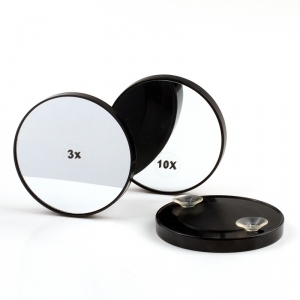 This small, handy mirror has a lot to offer. It magnifies 3 or 5 times revealing the smallest detail. Thus it is ideal for picking eyebrows, removing blackheads or for putting on contact lenses. Its 9 cm diameter makes it ideal to carry in any kind of handbag or toilet bag and because of its suction pads it sticks on any surface leaving both hands free.